Dwarf fruit trees are ideal for the home gardener who wishes to create a small fruit orchard but does not have the space for large trees. Some varieties of dwarf fruit trees grow well in containers and can even be grown indoors. Before planning a home fruit orchard, it is important to understand the pollinating characteristics of the plant. Without proper pollination, trees will not form fruit. 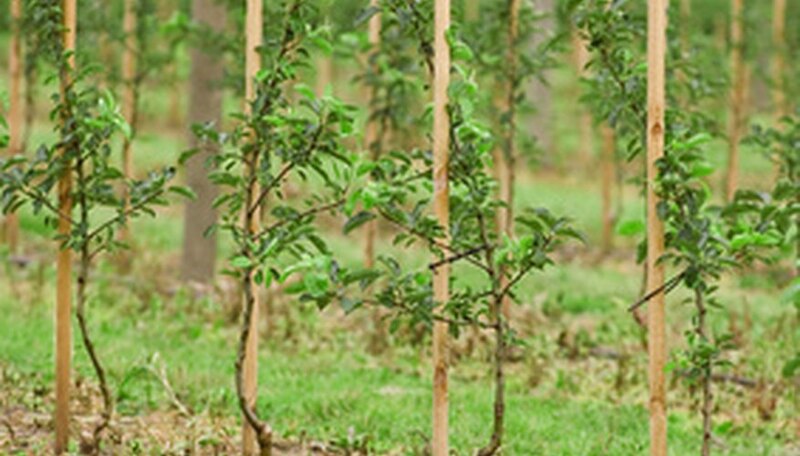 Dwarf fruit trees differ from the standard variety because of their reduced stature. Many dwarf tree varieties only reach a mature height under 10 feet tall, while standard trees can grow to heights over 30 feet tall. Many types of dwarf trees can be grown in an area of the garden about 8 feet wide, making them well suited for smaller yards. A third class of trees, known as semi-dwarf trees, are of medium stature, generally reaching a height between 10 and 16 feet tall. A self-pollinating fruit tree is one that does not require another type of tree for cross-pollination. In other words, the tree can pollinate itself, even if that is the only variety of tree planted in the home orchard. Self-pollinating trees are an ideal choice for the novice home orchard gardener. Several types of fruit trees come in both a dwarf stature and are self-pollinating. Consider planting peaches, nectarines and apricots, suggests Longwood Gardens. Other types of citrus trees such as lemons and limes may be available in self-pollinating varieties. Speak with the fruit tree experts at a nursery for more information about the pollinating characteristics of a particular tree. Even self-pollinating trees benefit from good maintenance and care. Plant two or three varieties of the same fruit type. Self-pollinating trees generally produce more fruit when planted near cross-pollinating varieties. Also, encourage bee activity in the yard by planting an array of flowers with various blooming times. Having flowers that bloom from early spring to late summer attracts bees, which help pollinate even self-pollinating trees. University of Florida; Growing Fruit Crops in Containers; Larry K. Jackson, et al.